Ants are bad enough on the ground, wreaking havoc with their intricately organized populations. Now, imagine them adding the ability to fly to that. 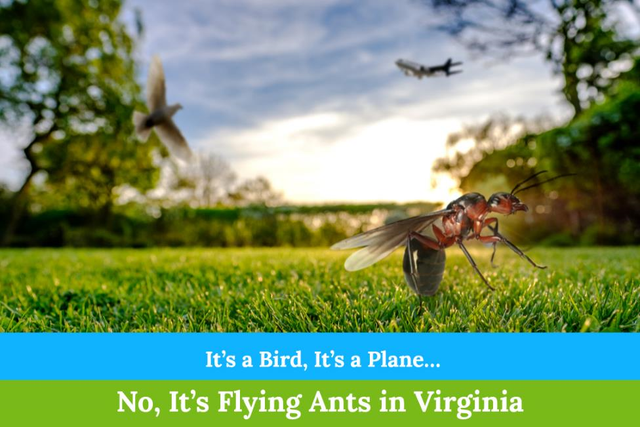 Unfortunately, it’s a reality with winged ants, who use their flying abilities to set up colonies all throughout Virginia. As it turns out, ants develop the ability to fly when they’re close to breeding. This makes them a problem for residents and business owners in our Old Dominion due to the possibility of a small colony growing into a big infestation – and a big problem. Flying ants aren’t genetic mutants. When ants gain the ability to fly, they’ve become sexually mature. They use their colony structure to the advantage, as the queen creates ants that are able to reproduce and, thus, help set up new colonies. The ants that are able to breed are referred to as “reproductive.” Once the queen produces them, worker ants make sure they stay fed as they go through their immature phases during the development process. When the colony is ready to expand naturally, the winged ants take flight. Mature female and male ants fly away from their colonies with one goal: to mate. People who study bugs refer to this voyage as a “nuptial flight,” which is also called a “dispersal.” You may have heard it called a swarm. Flying makes it possible for ants to mate with ants from other areas. By doing so, the insects are able to avoid the disease vulnerabilities that occur when any creature is inbred. Ants are ingenious creatures, and this is one the reasons why they’re so hard to exterminate. Quite simply, they’re the ultimate survivors. 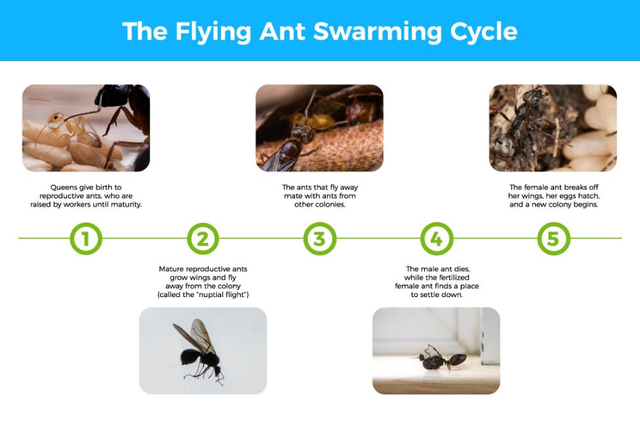 So, if you spot ants in your home and notice that they have wings, this is cause for alarm, as it means you may have an already-existing infestation on your hands. After mating, the male ants die, and the fertilized female ant flies around searching for the perfect nesting site. Different ant species have different nesting preferences. Some, like carpenter ants, prefer to live in rotting wood structures. They like Virginia due to its humid conditions (especially in the eastern part of the state) that create plenty of rotting wood. Pavements ants, on the other hand, make nests in sidewalk cracks, while odorous house ants are prevalent virtually everywhere. In her search for the best digs, a female ant might happen upon your home or business. Once she chooses a nesting location, she breaks off her wings and will never again take to the skies. This new queen will begin the arduous task of starting her own colony. She’ll use her defunct flying muscles for food, and they’ll give her the strength that she needs to lay eggs as well. Before you know it, the eggs will hatch, leading a colony that can number into the thousands without proper treatment. If you run into a big swarm of winged insects, it can be an intimidating experience – and one that might creep you out. But when ants are swarming, they are only interested in mating. A flying ant isn’t any more dangerous to you than a regular one crawling along the ground. If an ant species doesn’t have the ability to sting and won’t bite, then the flying breeders won’t either. But keep in mind that it’s not a good idea to stroll through a swarm of any insects, so do your best to avoid them. If they’re close to your residence, consider them a sign that you may have an infestation. Ants are the most common pest throughout the United States, but people often mistake them for termites when they start flying since both pests swarm. Termites are capable of causing damage to your home, so it’s important to know the difference between them. Carpenter ants are prevalent in Virginia, preferring to live in wooden structures like termites. But while termites make a meal of wood, carpenter ants do not. When it comes to dining, ants prefer to eat seeds, nectar, other insects, and food crumbs in homes. How can you identify termites from winged ants? Ants stand out because of their pinched waists, dark bodies, curved antennae, and back wings that are shorter than their front ones. Termites stand out because of their white or brown body, straight antennae, and well-formed jaws. If you see a swarm of flying insects on or near your property, don’t ignore it thinking that it’s a non-destructive species of ants. If it’s termites that are swarming, it’s important to act fast to prevent disastrous and expensive property damage. They may seem harmless, but ants are unwelcome for many reasons. For home and business owners, the presence of winged ants could mean that they have a hard-to-control infestation. While most ant species aren’t destructive, they can still bring germs and bacteria into a structure. It’s also an unpleasant experience to find insects in your home. If you run a business, whether it’s a retailer in Fredericksburg or a restaurant in Richmond, then winged ants could mean lost customers since pests can make a business seem uncared for and dirty. Ants can be tough to exterminate due to the size of their colonies and their strength as a unit. They nest practically everywhere in Virginia, building colonies that number from 300,000 to 500,000 insects. So, when it comes to this pest, whether they’ve recently flown in or they’ve been around for a while, professional ant control is a must. At Connor’s Pest Control, we combat ants with a thorough combination of spray and gel treatments. Contact us today to get rid of ants for good – guaranteed.